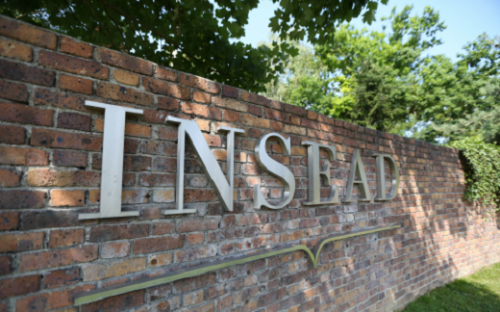 Home > News > Gmat > GMAT Vs GRE: What Do INSEAD, LBS, HEC Paris And 7 Other Top B-Schools Really Think? “We have to take GMAT scores with a pinch of salt,” says Michael Shulver, former academic director at a top 50 ranked UK business school. For Michael, the GMAT is the product of a broken system; schools give it weight due to its effect on rankings. For the majority of MBA admissions staff however, the GMAT remains the most respected standardized admission test; the correlation between GMAT scores and academic performance an accepted truth. But how important is the GMAT in an MBA application as a whole? And what about the GRE? The simple answer: it depends on the school. Business schools generally take a holistic approach to admissions, and most now accept both the GMAT and the GRE. But some - like INSEAD and Carnegie Mellon’s Tepper School of Business – prefer the quant-heavy GMAT. In truth, proportionately few full-time MBA applicants take the GRE. Only 11% of the incoming MBA class at NYU Stern submitted a GRE score. We spoke to admissions directors at top b-schools around the world to find out what they really think about the GMAT and the GRE. Minimum GMAT/GRE: 600/75% for the quantitative and verbal section of the GRE. Average GMAT: 648. We accept the GRE, but we prefer the GMAT. It’s a more standardized test and a better way of comparing similar applicants. And if you’re over our average GMAT that does put you in a significantly stronger position, especially when we’re awarding scholarships. We’ve only been accepting the GRE for the past three years, probably only 5% of our applicants take it and it’s really only US candidates who take it. Minimum GMAT: 600. Average GMAT: 700. The GMAT is a good indicator of academic performance, especially on the quantitative side. But the average from different regions does vary, so we’re open-minded. There’ll be people coming in on a 600 who might end up on the dean’s list. A good GMAT alone does not get you in, nor does a below average GMAT preclude you from joining. We look at the GRE with the equivalent standards. I’m really not impressed by the GMAT. GMAT is deemed important by the various bodies who rank MBA programs, so some deans of business schools try to bump up cohort GMAT scores to game the rankings. In turn, applicants play their part in the gaming by training obsessively for the test. In turn, there is a big industry that helps applicants train for GMAT. The whole system is broken and self-referential. At my previous school, there was great pressure on me to take candidates with ridiculously high GMAT scores, when I wanted to take more rounded individuals. And I was losing richness and diversity in my cohort because of this obsessive focus on GMAT. I looked into statistics; I looked at a 10-year span of GMAT scores compared with performance on the program, and I found it was basically flat-lined. There was no compelling relationship between GMAT scores and performance in modules. That was from one school, but it showed me that we have to take GMAT scores with a pinch of salt. No minimum GMAT/GRE. Average GMAT: 690. There is no specific difference for us; we use both, and we are happy using both. The outcomes of the students that we admitted with the GRE are great. The only thing we see is that the GRE is mostly taken by candidates from the US. No minimum GMAT/GRE. Average GMAT: 703. The GMAT exam is designed specifically by business schools for business school applicants. Over the years, we have been able to get a good understanding of the test results and how they can help us predict the academic capacity of our applicants. We accept the GRE primarily for applicants based in countries where the GMAT test is not offered. Minimum GMAT/GRE: 550/a combined 320. Average GMAT: 620. The GMAT is still the standard. We accept the GRE, but there’s not a huge number of students who take it. We’re looking for people with well-rounded personalities who fit into the environment. We could choose a student with a minimum GMAT score over someone with a 700 for example; it happens every year. GMAT really is a non-issue. A good GMAT score is great, but we are not blinded by a single metric. We are more interested in the whole individual and his or her passion that is behind the application. No Minimum GMAT/GRE. Average GMAT: 690. Average GRE: 159 verbal, 160 quantitative, 4.0 analytical writing (US News). We prefer the GMAT because it was created specifically to evaluate business-school candidates. However, we will accept the GRE, and those applicants are evaluated in the same way. When evaluating applications, the graduate exam is just one of several important factors. The GMAT simply provides an additional data point that offers insight into the student's ability to be successful academically in the program. No minimum GMAT/GRE. Average GMAT: 710. We evaluate applicants across three dimensions: their academic profile, professional achievements, and personal characteristics. Within the academic profile, the GMAT or GRE is assessed along with GPA (grade point average). Equally important to our process is that we screen for “fit” with NYU Stern; applicants who bring high emotional intelligence and have a passion for the school. No minimum GMAT/GRE. Average GMAT: 628. Candidates can submit either the GMAT or the GRE, as it’s important to us that students submit the test that most accurately reflects their strengths. The score is not assigned a specific weight in comparison to other parts of the application, but the most successful candidates will showcase a well-rounded application that includes strong quantitative, critical thinking, and language skills as evidenced by not only the GMAT or GRE but also by essays, recommendation letters, and the interview. No minimum GMAT. Average GMAT: 636. UWA do not accept the GRE. We view the GMAT as an important indicator of how successful applicants will be in an intensive study environment. When assessing applicants, we look equally at their interview score, demonstrating leadership potential and interpersonal skills, and their GMAT score, demonstrating aptitude and academic ability. We require either the GMAT or GRE as part of the application process to our full-time MBA program. We do not have a preference about which test an applicant chooses to take and submit. GRE and GMAT just give you one piece of the picture about a given candidate. We certainly want to make sure an applicant is going to succeed in our rigorous academic environment which is part of what a test score can assess. [However], no test score will be what defines your overall success in an MBA program or success over the longevity of your career or life, so my best advice is to adequately prepare for whatever test you choose to take, do your best to create the right frame of mind for yourself before and during the exam, try your best, and then move on to focus on other aspects of the application where you can also shine. Minimum GMAT/GRE: 600/80th percentile for verbal and quantitative reasoning. Average GMAT: 680. We think the GMAT is really important, but we’re not obsessed with how high the score is because our students come from so many different backgrounds. Some people might have difficulty with more numerical problems, but working under pressure, thinking creatively, problem solving—all of those skills are really important. Personally, I think the GMAT is a bit like an insurance—it is the only way of assessing that everyone can cope and do well with the academic side of the program. If you work in a team, you want to make sure the people that you’re sitting with won’t struggle but, at the same time, ensure you’re not the one who’s left behind. Test scores are important in giving us an idea of a candidate’s ability to be tested, to be able to cope with modules like accounting and economics. And, obviously having the GMAT or GRE, you know everybody has been tested to a certain standard. But we wouldn’t make a decision on a candidate based solely on their GMAT or GRE score, so if you don’t do so well don’t let it put you off applying entirely. I would always encourage candidates to come and have a conversation with us around their profile as a whole if they have any concerns. Both scores are acceptable as part of an application and it is important to highlight that, contrarily to some European schools, we do not accept applications without one of these. In theory, we are indifferent which score you submit. However, because roughly 90% of our applicants submit a GMAT score, the GMAT provides more of a comparison point versus the rest of the applicant pool. This means that, for the purpose of scholarship decisions, one could probably say that the GMAT is more impactful. Our GMAT average has been relatively flat over the past years. At times, there will be candidates who we admit knowing that their GMAT does not reflect their abilities. Such candidates can enrich the class at the price of bringing the GMAT average of the school down. Minimum GMAT: 600. Melbourne do not accept the GRE. We use GMAT scores to help us to recruit students from a diverse range of backgrounds. The test is a good indicator of someone's potential to thrive in an intense learning environment regardless of what country they grew up in or what school they went to. Based on our experience, individuals who earn higher GMAT scores are more likely to be successful in a one-year MBA program. A high GMAT score indicates not only that they will be able to grasp complex ideas, but that they will be able to do it quickly – which is vital to keep up with the pace of our full-time program. The GMAT has been the industry standard in business schools for many years. The GRE test is becoming more widely accepted in this sector, but it still has a way to go. We are looking at the GRE with interest as it continues to gain traction with business schools, and may consider using it in the future.